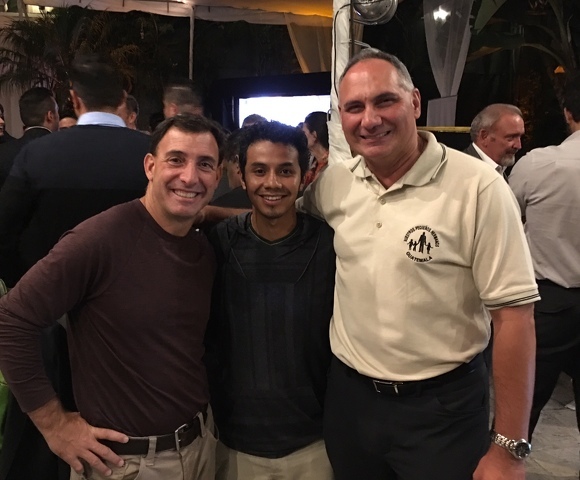 John DeBlasio, Jacinto and Joe Battista at the Central America Donor Forum in Guatemala. In the 1990 movie "Joe Versus the Volcano", Tom Hanks’ character, Joe Banks, works in a rather dehumanizing job and is diagnosed with an incurable disease and given 6 months to live. Joe accepts an offer from a greedy industrialist to live his remaining days “like a king.” All Joe has to do is throw himself into a volcano to help appease a local tribe’s need for a sacrifice to their fire god so the crooked businessman can get access to the valuable minerals on the small volcanic island. Marketed as “a story of love, lava and burning desire,” the romantic-comedy is really an allegory for Joe’s search for the meaning of his life and his place in the world. It is symbolic of the struggles most of us go through at some point in our lives. Why am I here? What is my purpose in life? Am I meant to make an impact on the world? Under the category of “God incidence,” I got a phone call in mid-August from a former Junior Penguin hockey player and retired Lt. Colonel, John DeBlasio, who I had coached 34 years ago. We have remained friends with John and his family ever since. His mother Janet is like a second mom for me and was the general manager of the Junior Penguins. She still does our taxes 34 years after we first met. Her husband Pat was the Mayor of Bridgeville, Pa., for several terms and they instilled a strong sense of family, community and philanthropy in their kids. So John’s initial purpose for calling was that he was dropping off his son Jack at Penn State. Jack is a freshman majoring in engineering and also plays for the Nittany Lion rugby team. We got together with our families to relive some old stories, talk about the future, and to help make Jack feel like “family” was closer than his Chicago home. As we discussed careers and the twists and turns that life throws our way, an interesting opportunity presented itself. John had sold his very successful business that helped with post-war reconstruction in Iraq. In his effort to make a difference he accepted the Gates-Buffet “Giving Pledge” challenge and established the Global Peace and Development Charitable Trust (GPD). John supports 14 charities and causes including the Center for the Study of Civil-Military Operations at West Point, The Center for the Study of the Middle East at the University of Denver, Army FM Radio in the Ukraine, Syria Direct, and NPH Youth Leadership in Guatemala. John had found his purpose and how to make a positive impact in the world and, perhaps, there was room for his old coach on his journey. So I packed up, grabbed my passport, and joined John in a consulting role for a weeklong trip to West Point (better known as Army) and to attend the Central America Donor Forum in the city of Antigua, Guatemala. On Monday, Sept. 26, I found myself in a series of meetings at the United States Military Academy at West Point where we met with the staff of the Center for the Study of Civil-Military Operations (CSCMO) that GPD helps to fund to discuss how to attract additional partners to support their program. That was followed by a presentation from Akiko Otani, the Managing Director of R3ady.org Asia-Pacific (they assist countries with disaster preparedness); lunch with the staff of Army Development and Alumni Services; and finally the staff of the Combating Terrorism Center (CTC). We also were honored to have a brief visit with Brigadier General Cindy Jebb, the first female dean of the USMA Academic Board. We dined that evening with the Department Chair for Geography and Environmental Engineering, Col. Wylie Thompson. I had previously met Col. Thompson in his role as the athletic officer for Army's hockey team, when they came to "Hockey Valley" for the first game ever at the Pegula Ice Arena. Small world. On Tuesday I listened intently to John's presentation to a class of cadets focused on the successes, mistakes and missed opportunities made with the civilian population during Iraq war. It was fascinating. He is so passionate about training young cadets about the importance of civilian relations during times of conflict. Suddenly the disappointing outcome of the Penn State-Michigan football game didn't seem so important. We headed to the city of Antigua in Guatemala for the Central America Donor Forum to look for additional funding partners for John's efforts and to visit with the staff and children of the Nuestros Pequenos Hermanos (NPH) School for orphaned, abandoned and disadvantaged children in the nearby town of Parramos. We met with NPH Director Chris Hoyt, a Notre Dame grad, and his staff, and I learned all about Father William Wasson who founded NPH in 1954 with the following core principles: Work, Responsibility, Sharing, and Security. One of his favorite sayings to the kids and staff was, "Never look back". I met so many great people and kids who had so little, but you could never tell by their interactions with Chris, John, and me. One of the students was Wilmer, who was shot by an errant bullet and paralyzed from the waist down. Wilmer is studying global markets and was reading the Professional Trader Package when we visited. The wallpaper page on his laptop says "Wall Street." I believe this young man will reach his goal of becoming a stock trader. I got to spend a little extra time with Wilmer’s brother, Jacinto, who joined us at the Donor Forum dinner. John worked the room with Jacinto to get one of the many donors to take a chance on the young man and give him a job. Jacinto told John, "One day, I don't want to just come back to NPH to serve, I want to be able to be a donor like you." The visit to NPH was equally heartbreaking and inspiring. The children have nothing, yet have everything. They smile, laugh, hug, and are so polite. Some of the stories are surreal. Some of the kids there actually watched their parents get killed right before them. NPH not only helps house, feed, and educate these children, thanks to John and GPD, they get access to leadership development, vocational training, and internships as part of the Seattle International Leadership Institute as well. How in the world did this all come to be? I certainly didn't see myself doing this in my lifetime. I first met John when he was 16 years old back in 1982. I was just 22 and thrust into a coaching role with the Pittsburgh Jr. Penguins. John was a brash, confident high school sophomore trying out for the 16-19 year old travel hockey team. He was not nearly as skilled as a lot of the kids at try-outs, but we noticed him because of his dogged determination and grit. In the end, we took a chance on a 5-foot 6-inch bundle of pure energy. We never regretted it as John would play for the team for three years and become a leader on and off the ice for a team that won two Mid-Am conference championships and twice finished third at the USA Hockey National tournament. John petitioned his state senator and was able to secure a spot at the United States Military Academy at West Point. Once he got there, he started out playing hockey, but switched to sprint football and ultimately, rugby, which became his passion. He was always busy and always driven to succeed. John finished his USMA degree in Engineering Management and headed off to Korea to fulfill his military commitment. He transitioned to the Army Reserves and earned a Master’s degree in international business studies from the University of South Carolina. John worked for 6 years for General Electric in their medical, plastics, and capital divisions before taking a job at the Meta Group as a Senior VP of International Operations. But as a Major in the Army Reserves, he was called back to duty in 2003 as part of Operation Iraqi Freedom. It was during this time that he found his calling and the roots of GPD began to take shape based on what he witnessed and the lessons he learned from his missions to Iraq and Afghanistan. While in Guatemala I had my own personal version of "Joe Versus the Volcano," and the volcano clearly won. We took a three-hour hike up the Pacaya Volcano that was a breathtaking (literally at 7,300 feet!) and exhausting "bucket list" experience. Our guide Roberto wound us through the lava fields, passed wild horses and dogs, and to the edge of the crater. We had an amazing and impactful time in Guatemala. It is a country of stark contrasts. Visually stunning geography and abject poverty. John DeBlasio is not one of those people. He is a game-changer. As John told some of the participants at the Donor Forum, "We are fighting indifference." John’s passion for making a difference in the world is indescribable. He lives a good life, worthy of the sacrifices and dangerous work he did for a decade helping to rebuild Iraq and Afghanistan. He is a smart businessman driven not by personal gain, but to be able to assist others. The latest wave of alleged "creepy clown" sightings nationally took hold at Penn State Monday night. What started as a rumor quickly turned into a rally of sorts. 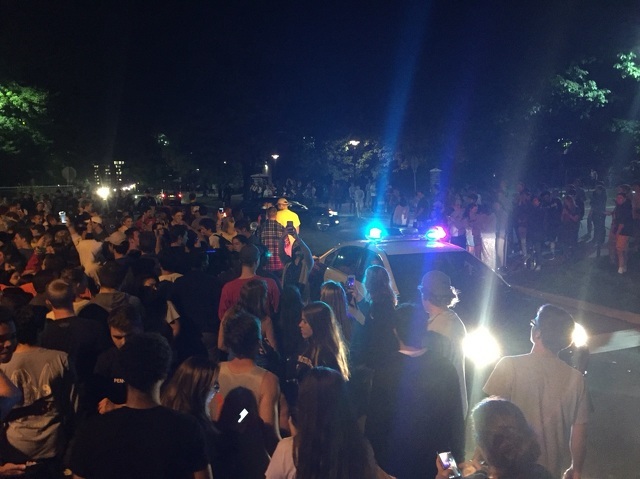 Once Penn Staters heard even the faintest mumblings of the word “clown” Monday night, students took to the streets and sidewalks of both campus and downtown to hunt the alleged clowns themselves.